New Delhi: The Saradha Ponzi scam shook up Bengali politics in April 2013, when Sudipto Sen, the MD and CEO of the Saradha group of companies, was arrested for fraud. Politicians cutting the party board, a majority from the ruling Trinamool Congress, were soon implicated in the case. 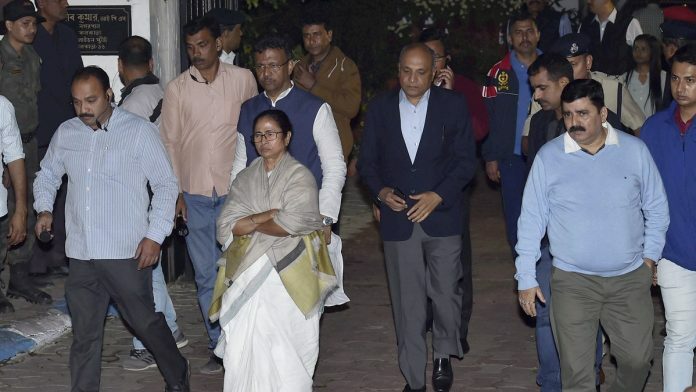 Ruling Trinamool leaders such as Ahmed Hasan Imran, Arpita Ghosh as well as the BJP’s Mukul Roy have been questioned in connection with the scam while former Trinamool MPs Srinjoy Bose and Kunal Ghosh, along with West Bengal transport minister Madan Mitra, were among those arrested. The Ponzi scheme is back in the news because of the current standoff between West Bengal Chief Minister Mamata Banerjee and the Central Bureau of Investigation (CBI) after the state government Sunday prevented the investigative agency’s officers from meeting Kolkata Police Commissioner Rajeev Kumar. Kumar is the SIT officer in charge of the Saradha investigation being conducted by the Kolkata Police. The CBI’s actions have led to Banerjee staging a dharna against what she alleges is the Centre’s attempt at a “constitutional coup”. ThePrint looks at the origins of the Ponzi scam and what has been done since to prevent a recurrence. With major interests in real estate, entertainment and tourism, the Saradha group once comprised of over 200 companies. It had been collecting deposits from the public through a few of its companies under various investment schemes until 2013. In collective investment initiatives, depositors are lured into putting their money in schemes or a business plan with the promise of high returns. In Saradha’s case, some of the funds were diverted by the group’s promoters, through loans, to promoter-linked companies at very low or zero interest rates. Some of these deposits were also unaccounted for in the company’s books. A few bad investments by the group led to a cash-flow problem and the group went bust in April 2013. This resulted in the loss of deposits worth nearly Rs 2,000 crore from 17 lakh depositors, according to official estimates. In May 2014, the Supreme Court transferred the Saradha Group investigation, along with probes into 44 deposit-mobilising companies suspected of such fraud, to the CBI. The unravelling of the Saradha scam turned the spotlight on the ruling Trinamool Congress. A majority of politicians named in the scam were from the party. These include Kunal Ghosh, Srinjoy Bose, Madan Mitra, Ahmed Hasan Imran, Arpita Ghosh, Srinjoy Bose and Mukul Roy. Roy has since joined the BJP while Bose has quit the Trinamool. Former Congress leader and current BJP Finance Minister in Assam, Himanta Biswa Sarma, is among the politicians whose properties were searched by the investigation agencies. Last month, the CBI filed a chargesheet against Nalini Chidambaram, wife of former finance minister and Congress veteran P. Chidambaram, for allegedly accepting a bribe of Rs 1.4 crore in the Ponzi scheme. What steps has central govt taken to prevent such schemes from flourishing? With Reserve Bank of India (RBI) and the Securities Exchange Board of India (SEBI) unable to effectively clamp down on such schemes, the government introduced the Banning of Unregulated Deposit Schemes Bill, 2018, in the Lok Sabha in July 2018 to protect small investors. The bill will plug the existing loopholes in the laws and gives powers to the government to stop companies from soliciting such funds. Those running Ponzi schemes could face a jail term of up to 10 years and a penalty of up to Rs 50 crore, according to provisions of the bill. The bill was referred to the standing committee of finance, which submitted its report in January this year.